Willie Ng (M.P.A. ’10) standing in front of the Bexar County Courthouse. Photo by Josh Huskin for the Spring 2015 issue of Gold & Blue magazine. Willie Ng (M.P.A. 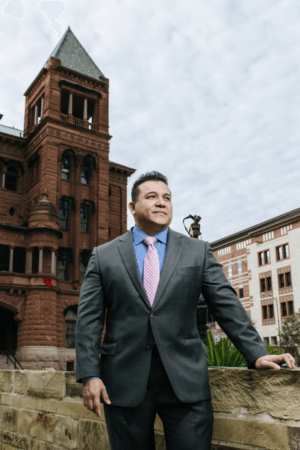 ’10) recently became chief criminal investigator for the Bexar County District Attorney’s Office after more than 20 years in law enforcement. He’s also the CEO of Blue Armor Security, a successful and growing security services company he founded in 2003. These are jobs not for the faint of heart, but Ng also has a softer side. He is active in charities and organizations that help children and families during the holiday season. He is passionate about education and juvenile outreach, even volunteering as interim CEO of the Juvenile Outreach and Vocational/Educational Network (JOVEN) in 2012. Meanwhile, his security company, which now employs about 300 people, allowed Ng to pay out of pocket while pursuing a Master of Public Administration at St. Mary’s. But that was a privilege he was not born with, and it made him realize the need for graduate-level scholarships. “In the summer, we had windows open and floor fans to keep cool,” Ng said of growing up on San Antonio’s Southeast side. Since 2010, Ng has established three scholarships: the Willie Ng Master in Public Administration Scholarship, the Dr. Henry Flores Scholarship and the Dr. Charles Cotrell Scholarship. Each is intended to help students pay for an education that Ng considers an investment.